Africa's savanna elephant (shown) is as different from Africa's forest elephant as Asian elephants are to mammoths, says a new study in PLoS Biology. Contrary to the belief of many scientists (as well as many members of the public), new research confirms that Africa has two — not one — species of elephant. Scientists from Harvard Medical School (HMS), the University of Illinois, and the University of York in the United Kingdom used genetic analysis to prove that the African savanna elephant and the smaller African forest elephant have been largely separated for several million years. The researchers, whose findings appear online (Dec. 21) in PLoS Biology, compared the DNA of modern elephants from Africa and Asia with DNA that they extracted from two extinct species: the woolly mammoth and the mastodon. Not only is this the first time that anyone has generated sequences for the mastodon nuclear genome, but it is also the first time that the Asian elephant, African forest elephant, African savanna elephant, the extinct woolly mammoth, and the extinct American mastodon have been looked at together. “Experimentally, we had a major challenge to extract DNA sequences from two fossils — mammoths and mastodons — and line them up with DNA from modern elephants over hundreds of sections of the genome,” says research scientist Nadin Rohland of the Department of Genetics at HMS. The possibility that the two might be separate species was first raised in 2001, but the current study is the most compelling scientific evidence so far that they are indeed distinct. 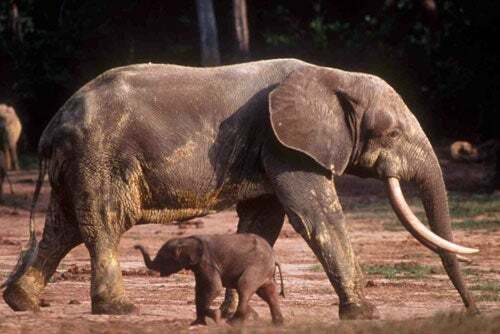 Previously, many naturalists believed that African savanna elephants and African forest elephants were two populations of the same species, despite the significant size differences. The savanna elephant has an average shoulder height of 3.5 meters while the forest elephant has an average shoulder height of 2.5 meters. The savanna elephant weighs between 6 and 7 tons, roughly double the weight of the forest elephant.